Just a few shots to share with you this morning. 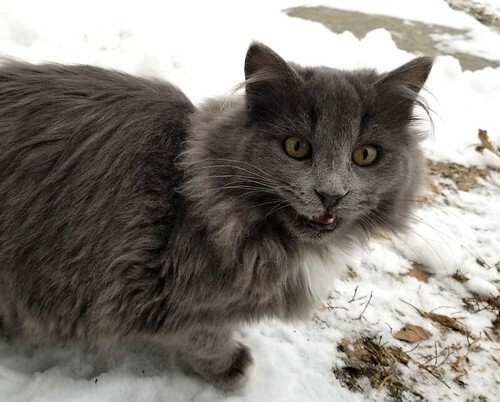 I was going to say I caught The Outsider, mid-meow, as I was feeding the outside cats this morning, but he wasn’t actually meowing when I took this shot. A couple of grosbeaks were trying to eat the frozen apples, left on this tree. 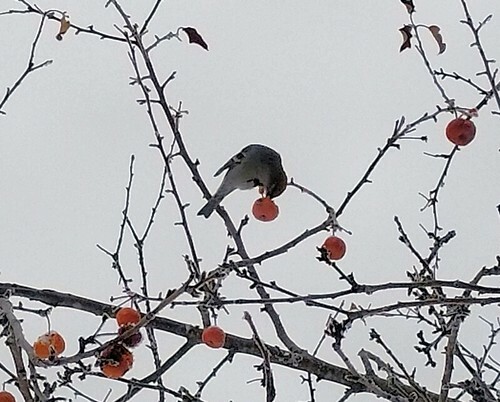 These apples won’t fall, even while being pecked apart by birds. No wonder I wasn’t able to knock down any more of them for the deer. Just a bit. Then she jumped back on me, as soon as I got close enough! 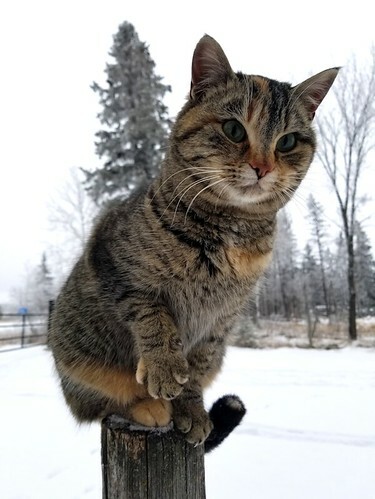 While taking the photo, I realized why she always has one paw up like that. There isn’t enough room on the top of the post for all 4 paws! We were able to make a trip into the city this morning, to finally visit my FIL. It’s been a while since my husband was up to the trip. The girls and I will need to head into the city again, soon – unusual for us to go that often, but we will be doing a fair bit of running around to various places on our next trip, in preparation for Christmas. I’ll have to remember to pick up more cat kibble. It’s been less than a week, and we’re already finishing off one big bag! Okay; so maybe we’re feeding a few more cats than last winter (13, compared to the 7 or 8 before).